1. Remove the PROFOIL from the box and open it out along the prepared folds. 2. Remove the plastic film from the adhesive side of the PROFOIL. IMPORTANT: this is NOT to be used as a separating film for the further use of the PROFOIL. The film is 100% suitable for recycling and can thus be disposed of in an environmentally friendly way. 3. If you want to store the PROFOIL, attach the enclosed protecting films to the rear end of the PROFOILS so the adhesive surfaces do not come into contact when they are then placed together! 4. Fold up the PROFOILS separately along the given folds and put them back into the box or the bag provided. the protective film MUST be used because if the adhesive surfaces come into contact with each other the PROFOIL can be damaged and the adhesive can be torn from the carrier material. if the PROFOIL is not folded properly, not only does this increase the packing dimensions, it may also deform the PROFOIL which can have a negative impact on performance. Remove the PROFOIL from the box and clip it onto the tip of the ski. Stick the PROFOIL down along the ski from the tip to the tail, ensuring that it is aligned with the edges. Make sure when doing so that the PROFOIL is taut towards the tail and that it is pressed down onto the base with slight pressure. Remove the protective film at the end of the PROFOIL and attach the mounting clip to the tail of the ski. Make sure that the clip is attached firmly at the tail and the PROFOIL is tout properly. Open the tail clip and pull the PROFOIL from the tail of the ski. Put the protective film onto the rear end of the PROFOIL immediately. Now remove the whole PROFOIL from the ski and fold it together using the prepared folds and so it is slightly taut. Folding it together precisely is important to avoid any soiling and prevent the glue from drying out. Put the PROFOIL back into the bag provided for storage. Never place the PROFOIL on radiators or other sources of heat. Do not leave the PROFOIL in the sun for long. Keep the properly dried PROFOIL in a cool, dry place away from light at all times when not in use. Check the condition of the glue after a longer period of use. Replace the layer of glue with a thin layer of adhesive which you can apply using a putty knife or brush on the cleaned PROFOIL and leave to dry for a minimum of 6 hours before folding together. Glues from other manufacturers must not be used under any circumstances. If the adhesive surfaces are very dirty we recommend you have them cleaned by a professional retailer first. The adhesive surface must not be scratched off. Fischer recommends KOHLA Tirol® care products. As a rule, the following applies: if the ski‘s base is in good condition, the adhesive will also work perfectly. Fischer recommends TOKO GRIP & GLIDE liquid wax to prevent snow from sticking and for better gliding properties. 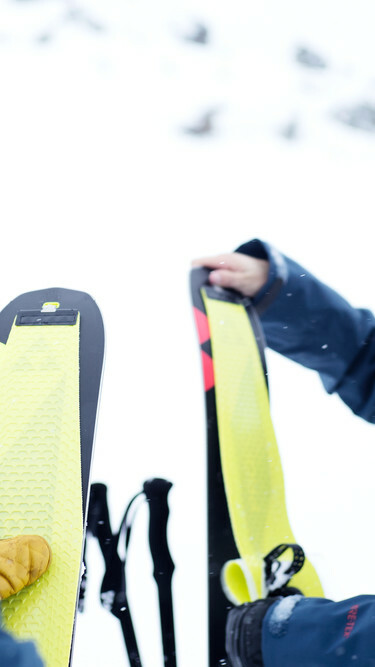 When attaching the PROFOIL make sure that the base of the ski is clean and free from snow. Never attach the PROFOIL to a dry or unwaxed ski. This can lead to a strong bond between the glue and the base which may make it difficult to remove the PROFOIL and/or in some cases may leave glue stuck to the ski. We recommend you use ski crampons in steep terrain and in hard snow conditions. Never place the PROFOIL together so it is glue-on-glue and do not roll up the PROFOIL!